Are you ready to try something new? Have you collected your fave ingredients from each of the three groups? Good! Let's make a face wash! This is so simple you're going to be done in a jiffy! Here's a step by step of how I made the face wash you see above. It's a lavender and cornflower combo that my skin is loving. Tip: Even though it doesn't require careful weighing and measuring of each ingredient, it's always a good idea to take notes of how much of each ingredient you have added. For example: I used heaping tablespoons to measure everything in this batch. Begin by whizzing each of your dried plants, teas, and food ingredients separately until they are as close to powder as you can get them. (Clays don't need whizzing). Above is 2 tablespoons of raw oats that have been thoroughly pulverised. 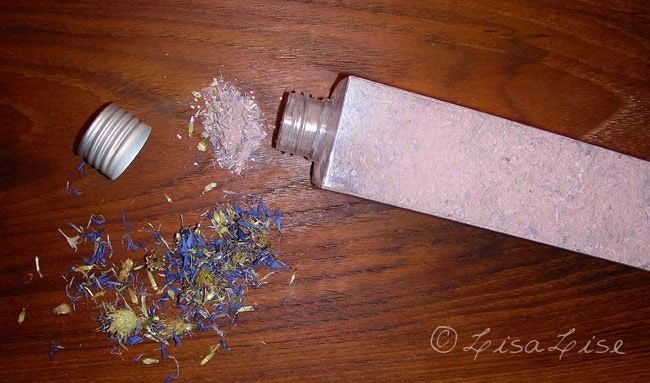 Some plants (like cornflower and lavender) will not turn completely into powder regardless of whizzing time. If in doubt: rub a bit of the ingredient between your fingers or into your palm to test how it feels on your skin. 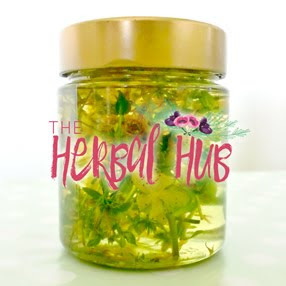 You will be rubbing this on your face and neck, so if there is any 'scratchiness', roughness, discomfort of any kind, whiz the ingredient until it is not scratchy or abrasive-feeling, replace it, or leave it out of the mixture. Here are the ingredients I used in this batch. 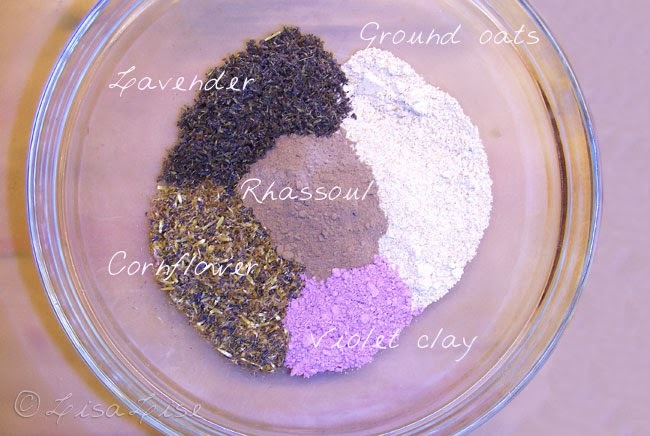 The violet clay was added purely for its fabulous color (I buy this clay from French Aroma Zone - check the sidebar under links). A small amount really boosted the look of the final mixture. The proportions here are approximately a third from each group, but you can easily change the proportions to suit your needs. 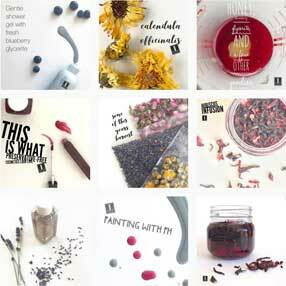 As you make more batches, you will develop a sense for how much of each ingredient works best for your skin. When all of your ingredients have been powderized, mix them together thoroughly, then transfer to your container. Voilá! Your face wash is ready to use! Shake out approx. a teaspoon of product into your palm. Drip a little water at a time onto the product and mix with your finger until you have a paste that can be applied to the face. Apply to face and neck and massage gently. If you have normal, oily or combination skin, you can leave the mixture on for 1-2 minutes. Do not allow the product to dry on your face. Mist your face and neck with hydrosol or quality skin tonic. Be sure to cap the bottle immediately after measuring out a portion and to keep the cap and opening completely dry at all times. If ANY moisture comes into contact with your product while it is in the container, you will have created the perfect environment for mold, fungus, bacteria and all kinds of other beasties. If you make a face wash with dry ingredients I'd love to hear what you used and how it worked for you. I think that it would also work fabulously as a mask. I would like to share a little tip. This violet clay from AZ (I love them, they are my main supplier) is just a mix of colin clay and manganese violet (CI 77742). Just by adding a small amount of pigment to plain white caolin you can have this gorgeus clay. 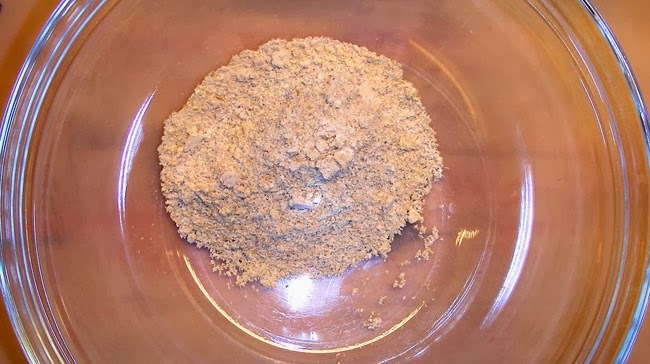 It's the same principle than making calamine powder (calamine is a mix of zinc oxide and iron oxide, an can be done by mixing 98-99% zinc oxide with 1-2% red iron oxide). Manganese violet can be found on you normal supplier of mineral make up pigments. Hi Jana Great! Let me know how it goes! I think your shampoo idea sounds quite interesting. 2. Your addition of oats might be a bit of a slippery experience depending on how much you have added. It could also be a bit difficult to rinse out. The chamomile is a great idea. ALl in all, I'd say give it a shot and see how it goes! Also, I really like making a scrubbier version where I blend adzuki beans, rice, white clay and rose and lavender EO. Its inspired by a mix that Body Shop once carried. 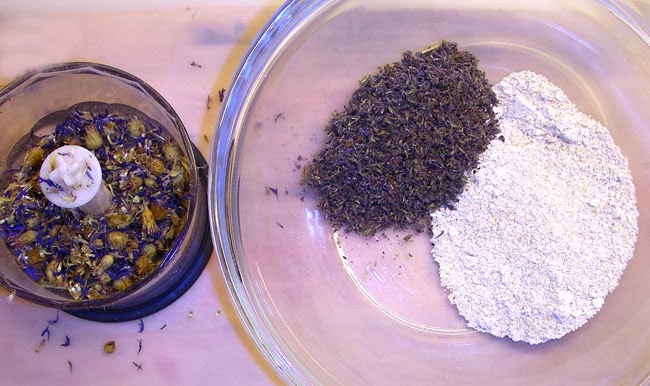 I change my recipe and use oatmeal and dried lavender if my skin feels sensitive. The fun starts when you start mixing and its simple and easy and I love that it keeps and dosnt go bad. I scrub and sometimes leave it on as a mask and let the clay work its magic. I was at a Body Shop yesterday and there was a teenage boy and his mom in the store asking about clay masks. The mom talked about how they's used yeast to make a mask for his problem skin and I smiled cause I did the same. Simple, cheap, effective and no fuss or strange ingredients. I couldnt help telling them I did the same and the girl behind the counter looked almost chocked thinking about it ;-) A little reminder to myself that I did make my won stuff when I was a teenager and read Maurce Messegue's books with great interest. Also, good point on writing down how much you use. Wouldnt it be terrible if you made the perfect product for your skin and didnt have the exact recipe? PS. Another favorite cleanser of mine is a the first one I made by finely blending stuff from my kitchen cabinet: oatmeal, mint, green tea, camomille and white clay. 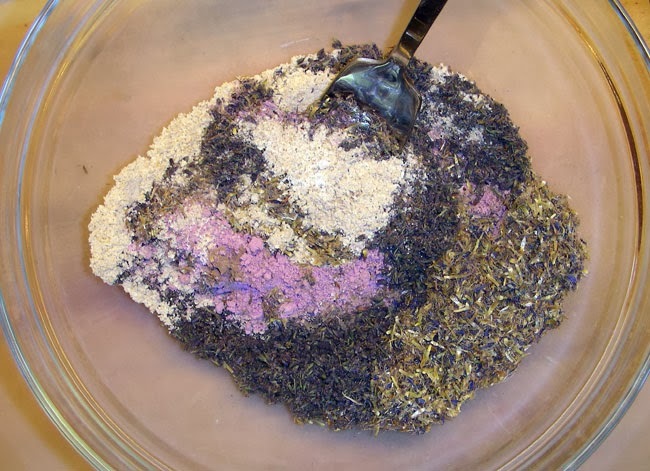 I have some orange peel powder that I bought and then didnt know what to do with and Ive added it to this mix. I love the smell of this blend and also use it for a body scrub, just mixing in blended rice or salt. HI Tina - Ooh this is great input! I used to work with adzuki beans a long time ago. Must see about revisiting those again. The yeast mask for problem skin sounds very intriguing-- how does this work? I am very flattered you like my pictures. Thank you so much. Lise, its as simple as mixing yeast with water then applying, nothing more to it! I gues the smell can take a little getting used to but it never bothered me and it works. Tina - thanks so much! I have never heard of this before (just when you think you've heard everything!). This needs further exploring! I feel a new blog post coming on! Ok. I have oily acne prone skin and starting 25th of january 2015, I will be using a powder mix as my face wash and a pH toner/moisturizer. My powder will be : oats, thyme and bentonite clay. Will be mixing with honey and water. Toner : distilled water, ACV (to bring pH to 4), MSM (2%) and glycerin (5%). A little about my skin, I've had acne since I was 11 (first year of high school), I'm 29 now. Haven't seen my skin spot free since I was ten. Yep. I really don't want to turn 30 with this. Anyways I will be posting an update every month if you're interested in hearing. LOVE YOUR BLOG!!!!!! I have to say I am loving my food, flowers and dirt! I am trying to keep my beauty/hair regime really simple but effective and this is a humble star. The ingredients I had at home and was so easy. Mixed together then added 1 tsp Alma and 1tsp Reetha as they were all in my box of goodies. Put in a small lotion disk cap bottle, with enough space to shake and I am in cleansing joy. 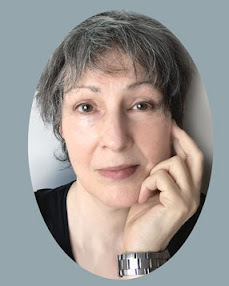 Thank you for your generous spirit and blog. In just a few days of night time use only, my skin is smoother and dare I say, brighter and all this without my tetchy skin reacting to the change of cleanser. 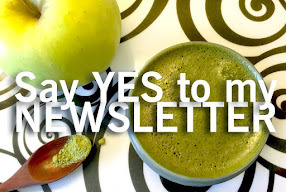 Hi Jo - I am so pleased you are enjoying your own cleanser - and absolutely loving your combo of ingredients! I'm on my way to incorporate almond meal and malva in my next cleanser! Thanks for sharing! I use my coffee grinder to cut the oil and blend it well into my powder. It ends up turning slightly darker with a light "wet sand" texture and has held up really well. I use it every morning for a morning cleanse and gentle exfoliant. It makes my skin so soft and mineral makeup-ready. I store it in a spice jar with the plastic sifter top WELL away from moisture! I sprinkle a little in my hand before getting in the shower and use it in the shower or apply as a mask before getting in the shower too. SO far, this is my second batch with oil in it and it hasn't had any funky odor of growth to it. One batch usually lasts me about 2 months! Hi Ashlynn--- Oooh you have some great ingredients there! I do like your addition of oil for the extra softening action. As long as you are careful to keep any water and moisture away from your mixture, you'll probably be ok. It's not a bad idea to make smaller portions and use within a month or 2. You're doing everything right!